Podcasts have proven an immensely popular new medium of entertainment in recent years, and are commonly special recordings, made with the podcast market in mind. 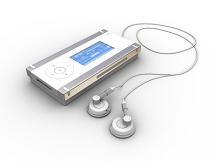 The MP3 player market is immensely fragmented with literally hundreds of different brands available. Some of the most popular presently are Apple`s iPod, which has sold over 150 million units worldwide in its various forms, and is bundled with the easy to use iTunes software, the Zen range from Creative, which has sold around 80 million units, although the range has been around longer than the iPod range. Sandisk are a memory chip company who are one of the lesser-known successes in MP3 sales, as they do not directly advertise their range. Lateral production integration allows them to offer some of the best value players on the market, and they have sold around 50 million units worldwide from their `Sansa` range. There are a lot of sham offers in existence for iPods, and it can be safest to stick to a retailer you trust, such as Comet or Argos on the high street or Amazon and Play.com online. Because the Zen range and the Sansa are less well known, it may be easier to search online for the best deal. Amazon offer a wide range of players by offering items from other sellers through their website, especially on the impressive Sandisk Sansa e280 and Creative Zen 16. Because of this, do not be afraid to also check eBay. The output of your player, however, is paramount, and used speakers can give an inferior sound. Almost all MP3 players are now compatible with wireless speaker systems, which have fast become the best home set up for listening to MP3 music and podcasts.